Like many of the things we live with in a cob house Earthen floors are a commonly misunderstood feature. I think that the common picture people construct when they hear Earthen Floor is much like a horse stall. Dusty, dirty, maybe not covered in horse manure, but not something particularly pleasant for where you get ready in the morning. This was our first earthen floor and the available resources on making one from scratch is a bit limited. Still, we were able to find a number of physical and electronic resources that could guide us on our design and mixture. Our floors consist of a very thick mass of cob (sand, clay, and straw) packed and smoothed over a drainage layer of pea gravel. This was followed up by a thinner (2-3 inch) layer of smooth floor mix. We recommend making numerous test batches for your final floor. Many examples online will show people putting in floors that crack terribly when drying, sometimes this is desired and then the cracks are filled with a separate colored material. We were going for a recipe that would not crack and we landed on using very fine silica sand (70 grit), sifted horse manure (so I guess there is manure on the floor), wheat paste, borax, and powdered red art clay from a local pottery manufacturer. These materials can be found very cheap when local, or possibly free if you do some searching. Again, I would stress making multiple tests until you get what you want. Once this thinner layer had dried we decided to follow up with a red aliz painted onto the floor. We decided to do this because our final floor layer had not come out as smooth as we had really wanted. I think perhaps if we had spent more time troweling this wouldn't have been needed. 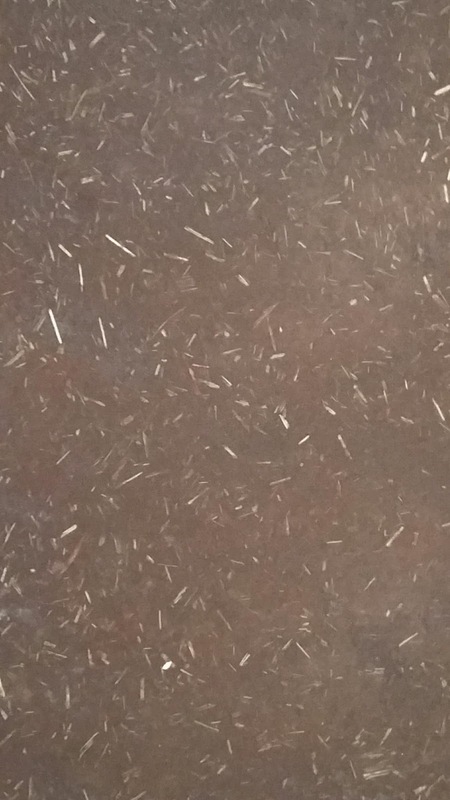 However, for the aliz we used very finely sifted straw that added a really beautiful finish to our floors. 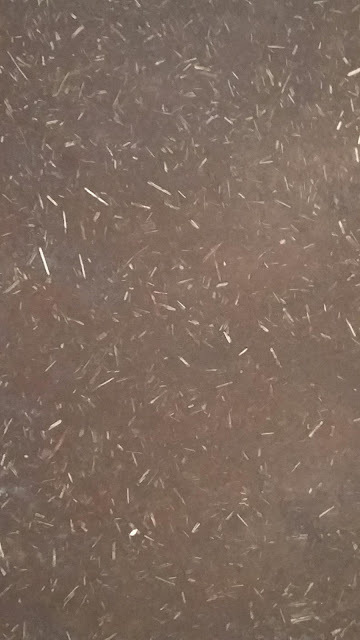 The small pieces of straw are flecked throughout the dark red floor. There are many different oils you can use to finish your floor, but the most important thing is to give your floor an adequate amount of time to dry before oiling. I've seen and read about others' floors performing very terribly because they didn't let the moisture leave their floor before oiling. On our floors we chose to put down multiple layers of boiled linseed oil (something I would have definitely preferred not to do), but the cost of better oils like Tung oil made us stoop to oil with a chemical drying agent. On the plus side, the drying times for boiled linseed oil are much quicker than pure oils like Tung. Wanting to finish our floors with something nice we did follow up with one layer of Tung oil and then also waxed with Heritage Natural Finishes Liquid Wax End Sealer. This company is wonderful and will help answer any question you might have, I highly recommend purchasing all of your oil from them if you have the money to spare. So how are they holding up almost a year later. Great! We have had little issues with our floor, it will definitely dent if you drop something with an edge on it. I gouged it nicely with a piece of firewood that slipped out of my hand. Also, be wary of earthen floors near a fireplace or rmh. We have found that the floors will heat up and soften when we burn our rmh for a longer period of time. Consequently the oils continue to penetrate into the floor and leave the surface a bit dry. I don't foresee this as a real problem as a new coat of oil is beneficial for the whole floor every few years. 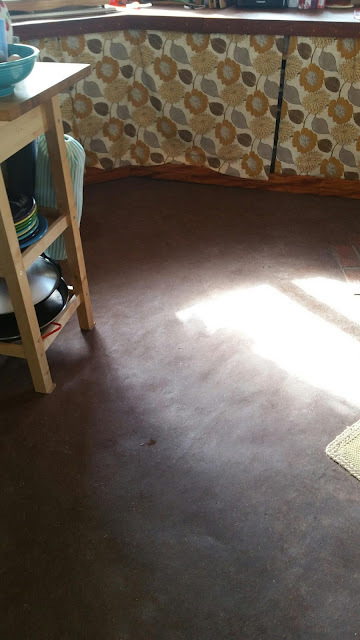 However, the softened floor is more of an issue as it is the favorite place for our doggies to jump off of the bench. It took a little bit of time for us to realize it was the dogs' nails that was causing little indentations in the floor. I think a few coats of oil and another finish of wax will help harden up the surface and fill in the small imprints, but the next house will be getting a brick or stone floor around the rmh. Cleaning is also a breeze, sweeping is a daily process with two hulking and fuzzy malamutes, but I think the sweeping process has actually smoothed the floors even more. Periodically we will mop the floor with hot water and some essential oils. This works quite well to remove any outside dirt brought in and leave them smelling nicely. As always I'll finish this post with some helpful resources. I suggest the book "Earthen Floors: A Modern Approach to an Ancient Practice" by Sukita Crimmel and James Thomson. Also Becky Bee's book "The Cob Builder's Handbook" has a small section devoted to floors. As always, Cob Cottage Company and Permies are the best places to find any information you are looking for. As a general rule of thumb, cob builders are a friendly and sharing group, so ask away for information from the experienced. Your floors feel and look warm and inviting! We have wood floors and they dent, too, if you drop something on them. Your dog looks so cozy on the bench. Your house is beautiful! I would love to have one like it. Can I ask you a couple questions?.......If you don't mind telling us, what did this house cost you? Can a cob house be built with running water? Are there any builders out there who will come build one for me?? 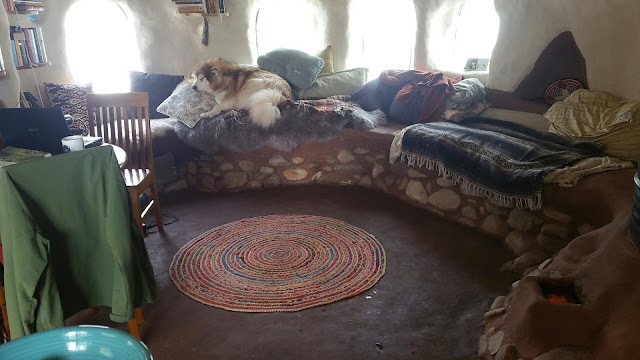 Cob houses cost however much you want them to cost. There are houses built for $1000 and others for $90000. We built ours for around $3500. This low cost is possible when the owner is the builder and you are willing to look for materials often for cheap or free. A third of our cost was the epdm pond liner that makes up the moisture barrier on our roof. There are many cob houses built with running water. This is easy to do and can be set up like any conventionally built home. It is difficult to find contractors who will build with cob as it isn't well known in the construction world. If you can find a company si.ilar to Cob Cottage Company in Coquille Oregon, they might do a house building workshop for very little cost to you. I always suggest doing a lot of research before deciding on cob. There are plenty of resources mentioned throughout this blog. Please feel free to ask as many questions as you want. Love this! Thank you so much for the information! This is great! I would love to hear an update on how your new place is coming along. I, too, would like an update. How are things going in Montana?